. . . and babies make four. : A little crafty fun. 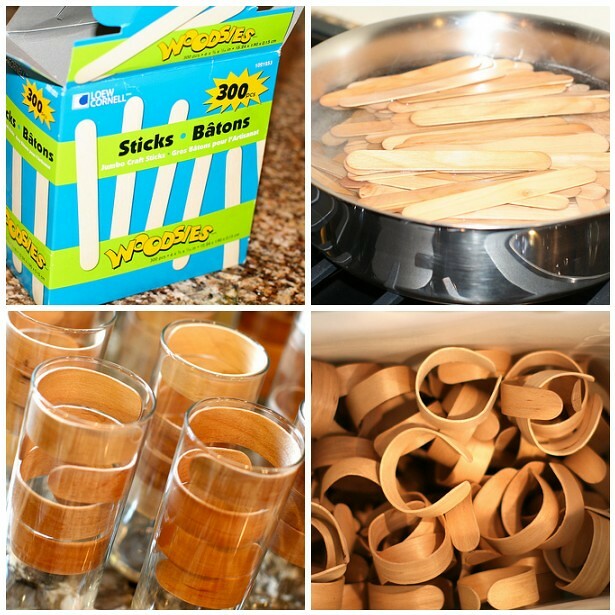 Popsicle sticks -- the large size that's 3/4" x 6"
While the Popsicle sticks are still warm, gently bend them and place them inside a narrow glass. Some of the Popsicle sticks will break when you bend them. There doesn't seem to be a rhyme or reason for why they break. It's probably just the way the wood was cut. Let them dry for 24 hours in the glass, or I put some of them in a 200-degree oven until they were dry, which I think worked much better. If you're going to put them in the oven, make sure that your glasses are tempered. Use an unbent Popsicle stick as a template and trace the shape on the back of a piece of scrapbook paper, then cut it out. 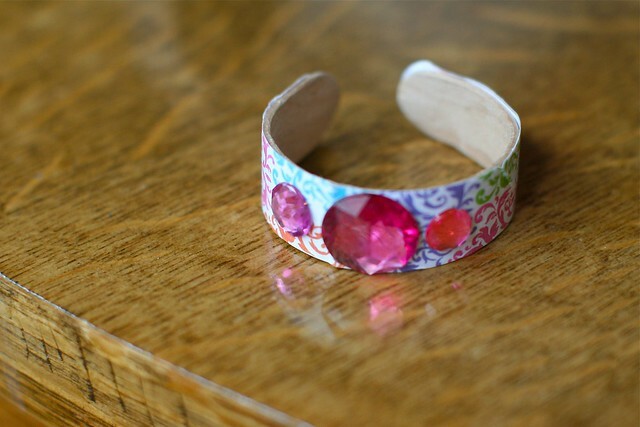 Apply Modge Podge to the outside of the bracelet and then carefully apply the paper. It works much better to apply the Modge Podge to the bracelet and not to the paper. Brush Modge Podge over the top of the paper and smooth out any bubbles with your finger. Let the bracelet dry and add rhinestones with Tacky Glue. * In the spirit of full disclosure, boiling and bending the Popsicle sticks into bracelets was much more time consuming than I ever anticipated. I think part of the problem was that I made 150 of them and it took some trial and error on my part to figure out that boiling really does work much better than soaking. If you were just making a few for your kids, it wouldn't take nearly as long and would be a fun project. 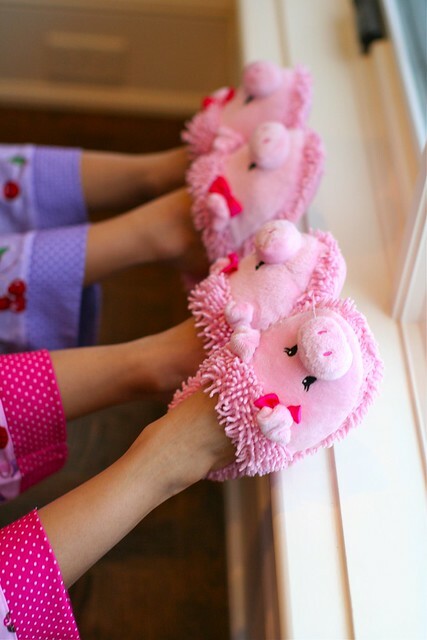 My girls -- and the girls at the sleepover -- loved decorating them and they really are cute. Just remember to boil more Popsicle sticks than you actually need since about 20% of them will break. Also make sure they are completely dry or they will start to unbend again. What a great idea. Could headbands also be made or are they too short? A friend told me that they work as American Girl doll headbands but they'd be too small for regular headbands. Such a fun and cool idea! Thanks for all the tips! May I ask where you got those adorable chocolate pjs? Thanks! 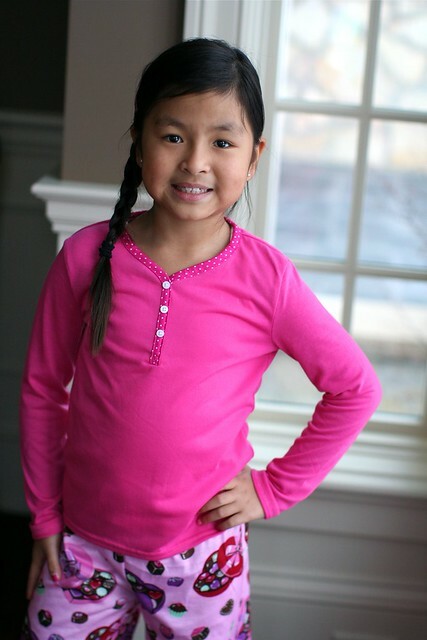 The PJs are from Target! Love these! Does it have to be modged podged between the paper and stick? Also do you protect the paper after it's been adhered to the stick? Thx. Oops - just saw that you do modge podge the paper after it's on the stick - but can it be glued to the stick rather than modged podged? Thx. It will work best if you used Modge Podge to adhere the paper to the bracelet and then to coat the paper on the top. The good thing about Modge Podge is that it works well with paper and doesn't make it get all wonky. I'm sure you could also use glue stick or even Elmer's Glue watered down a little to adhere it to the bracelet. I'm not sure how well something other than Modge Podge would work on the top.